You can watch this 3 minute video summary of this program. Or listen to the program right now on Soundcloud! It’s funny how things build up, how they leak out, finally reaching us. A couple returned to my village from their winter in the Philippines. She grew up there. They had never been so hot, and so dry. They are religious, and they prayed for at least a cloud, to get relief from the relentless sun. Then I get an email from a radio friend abroad. He’s Robin Upton, the producer who revived the deep alternative show “Unwelcome Guests” when Lynn Gary retired. Google it, or go to unwelcomeguests.net. As an aside, Robin said the heat was in the unbearable range. Heat laced with humidity – over 35 degrees C, or 95 Fahrenheit became the daily normal, flaring up above that at times. Upton was writing from his adopted home in Bangladesh. A headline flickered in my brain, a one-off story asking if India was experiencing the worst drought ever. Or maybe the worst since 2002. Hundreds are dying of the heat. Fields have burned off dry. The only hope for millions, maybe hundreds of millions, is an above-average monsoon season, this June to September. In the meantime, in parts of the State of Maharashtra, a Criminal law forbids more than five people at a time at any water supply. The authorities fear conflict, maybe violence. By the way, the super hot weather is melting snow and ice on Mount Everest faster. Changes in the cryosphere in the Himalayas may even create more heatwaves in Europe! Everybody is included in climate change. Vietnam flashes up in my news and Twitter feed. 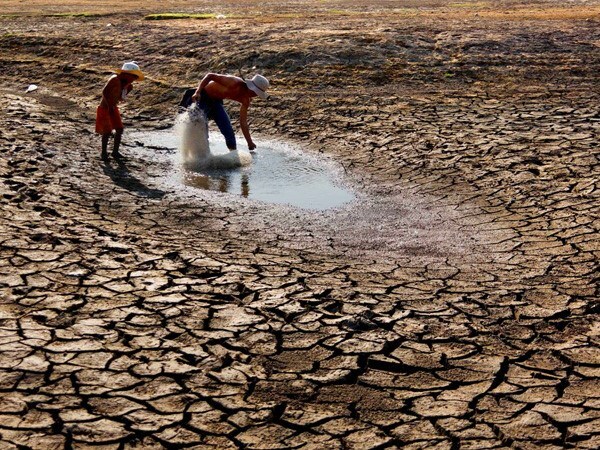 Along with India and Bangladesh, Vietnam is going through a hot punishing dry period. Vietnam is normally a major exporter of rice. This year, not. A band of suffering has taken over south Asia. 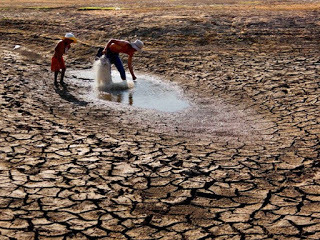 Yes, its partly because of El Nino, but a super El Nino adding it’s might to the upward pace of global warming. That is one of the world emergencies being blotted out of our minds and screens by endless celebrity trivia, and fake political choices. During this past week, climate scientist Paul Beckwith ventured into our darker places. Paul is frustrated with scientists who are constantly surprise the climate beast is roaring already, in so many ways. The global community has had 21 COP meetings, the Conference of the Parties to a Treaty that has done nothing to stop escalating emissions and committment to a climate-damaged future. Maybe, Paul wonders, a regional nuclear exchange between India and Pakistan would stir up enough dust, to block enough sun, to cool us down for a few years. The dust of a decent sized nuclear explosion would spread throughout the northern hemisphere, likely cooling the planet an astounding one to one and a half degrees, within weeks. It might put a halt to the wildly growing melting of Greenland. The cooling might save the last of the reflective Arctic Ice cap. Paul’s second video on local nuclear war, explaining further, is here. It’s not just Paul talking about this. You can find a 2010 article on the same subject by respected scientist Alan Robock (and Brian Toon) as published in Scientific American here. Paul explains we have lots of nuclear weapons. Just one big one from Russia or America would do the job. The cooling would last at least five years, maybe ten. Of course then the world would jump to new heat levels, because we’ve just hidden another ten years of huge greenhouse gas emissions under the nuclear cloud. Maybe we’d have to blow off two the next time. As Beckwith stands in front of a screen explaining nuclear winter, I spy in the right hand corner another graphic explaining the nuclear explosion would also demolish most of the protective ozone in the Northern Hemisphere. Those who go outside without wearing a protective bag would ratchet up their risk of cancer. Everyone would have to wear eye protection to prevent blindness – at least everyone who could afford the special sun glasses. I suppose that didn’t happen during nuclear tests in the 1960’s, but then many seniors are getting multiple skin cancers. I just had one removed. The whole project goes crazy, and Paul knows that. I think he’s just telling us how serious this climate shift is, how we We are deluding ourselves about climate action, and the fact that we are not ready to cool the planet in this emergency. Which brings me to James Hansen. Many of you know Dr. Hansen, the former Director of the Goddard Space Center of NASA – as the man who warned the U.S. Congress about dangerous climate change in 1988. He’s struggled with this threat ever since. Last summer, Hansen and a collection of prestigious academics around the world, broke scientific protocol by publicly speaking about their research. Paul Beckwith did a series of nine videos to explore and explain what Hansen and his co-scientists were saying. Find that video series on You tube, or at paulbeckwith.net. This March, they officially published their study. It got some press. It’s huge. Why haven’t I said anything about it on Radio Ecoshock? There are problems. First, of course I invited Dr. Hansen to appear on this program. I got no reply. I have no inside track to reach him. Hansen can pick his world media for appearances. Second, there has been a fairly strong chorus of criticism of this paper. Of course a few complained that the process was broken. But Hansen says this scientific warning is much too important to wait a year before telling the population what is coming. Other scientists simply disagree with either his conclusions, or his method of reaching them. A few have said, for example, that Hansen and team did not reach their vision of an ultra-stormy future in a ruined atmosphere by using models. The paper refers to evidence of super storms, that could move 1,000 ton boulders inland from the shore. We can see these mysterious boulders on Caribbean islands. This is part of the paleoclimate record, but there are questions about how the Hansen team connected those time to these times. It is possible that the vision of dangerous and damaged decades to come was assumed, rather than proven. At that point, and really before then, I am not skilled enough to judge. Plus, I think Hansen can be mistaken. I believe his promotion of nuclear energy as a solution for climate change is mistaken. I hope to have more on that in a future show. That is partly why I haven’t covered this story. Another part is a deep feeling that I might not be able to bear knowing what Hansen knows. You see, we’ve all been sold a picture of slowly developing climate change. In countless interviews scientists have cautioned that melting glaciers like Greenland and Antarctica will take hundred of years at least. The global mean temperature has only been going up slowly. The Intergovernmental Panel on Climate Change is discussing how we can still burn more fossil fuels, peak in a decade or two, and gradually come down, with quite survivable impacts. The seas will only rise slowly. It’s the mantra of changes in geologic time. If James Hansen is right, all this is wrong. The stakes are enormous, far larger than anything humans have experienced, bigger than the Earth has seen in more than 50 million years. The speed of change may be absolutely new. In a way, Hansen spoke partly to other scientists. The full impact of what could happen is not explained, although I suppose for a scientist of his calibre to warn “all Hell will break loose in the North Atlantic” is pretty clear. Losing most of our coastal cities by the end of this century is clear enough. The time of the great storms is left to our imagination. I’m going to re-read this paper, watch another dozen videos, listen to the scientific back talk. I’ll come back to this paper when I know more. I’m also in touch with some of the co-authors of the paper, to get their views in coming programs. Meanwhile the recording of carbon dioxide in the atmosphere at Manu Loa Hawaii hit another frightening record of 409 parts per million. We started at 280 ppm at the beginning of the industrial revolution. During most of my life it has climbed slowly but surely. Now it’s peaking, so that the new lows will be the old highs, and the new highs have never been seen on Earth for many millions of years. Greenland has begun its summer melt season in early April. That’s another record. Worrying news is pouring in from a wave of scientific papers around the world. My jaw drops, my nerves tingle, at least a dozen times a week. No one can keep up. All we know is that it’s coming, and we are sleepwalking into a new more dangerous world. Sometime soon, or maybe yesterday, we reach the damage that can never be undone in thousands of years. We are writing our wills for our descendants. Through our actions and inactions, we promise them a damaged atmosphere, with unstable weather and strange seas. The bugs, the plants and the other animals will move and change as they can. The future of our species cannot yet be written, even by the most imaginative science fiction writers, or poets of tragedy. Unless we can pull off a miracle of collective action, the future will be distorted beyond recognition. That is the only certainty. We talked about the dry heat in East Asia, and the possibility of creating dust to cool the world in an emergency. But there is already a long season of smoky haze hanging over a lot of Asia, especially over Indonesia, Malaysia and Singapore. Unfortunately, that smoky is unlikely to cool anything. It comes from burning tropical forests in the islands of Indonesia. There is black carbon in it, which will soak up sunlight and heat. Even worse, a lot of the fires are actually burning peat, that compact vegetative matter just one step below coal for carbon pollution. When the biggest peat fires erupted in Indonesia in a previous El Nino of 1997-98, it launched that country into the top three greenhouse gas polluters in the world. The peat fires continue, as big corporations and small land holders clear and drain the tropical forests, transforming them into palm oil plantations. I got an email from listener Yew Jin Lee, offering to ask the experts why haze was covering Malaysia and Singapore yet again. Yew Jin is a Master’s student studying Environmental Sciences at the University of Cologne in Germany. He carefully crafted this report for Radio Ecoshock. For Radio Ecoshock, Yew Jin Lee interviews Dr. Helena Varkkey, senior lecturer at the University of Malaya; Alan Tan, professor of the National University of Singapore Law School; and Dr. Rachel Carmenta, Post-Doctoral Fellow at CIFOR ” the centre for international forestry research in Indonesia. Asian haze interview (17 minutes) in CD Quality. Near the beginning of this program, I mentioned Robin Upton, now a resident of Bangladesh. Robin rescued one of the most popular underground radio shows, called Unwelcome Guests. It was founded by New York State resident Lynn Gary, who ran produced the show for years and years. Unwelcome Guests covers alternative speeches and ideas in depth, with a two hour show each week. You can get it at radio4all.net, or at unwelcomeguests.net. As we play out this week, you will hear just the start of a full program #726 on the work of Ernest Becker. His book “The Denial of Death” won the Pulitzer Prize for General Non-fiction in 1974, just before Ernest died. Only the Western culture struggles so hard to deny the reality of death, and I think that is directly connect to our parallel denial of abrupt climate change. Good bye from me, Alex Smith for this week. "Only the Western culture struggles so hard to deny the reality of death" – oh Alex. The whole point of denial is it is a HUMAN trait, not a western civ. trait. Virtually ALL human cultures have some fantasy belief in an afterlife, it is why we bury our dead with trinkets and rituals, it is why we pray to non-existent deities and offer them gifts and sacrifices. The assertion that western culture is to blame for climate change denial is so intellectually weak it is generally the purview of historically challenged, callow, self-styled anarchists with the mental age of a college freshman. And I am sorely disappointed that you promoted, by even mentioning, the absurd idea that we deliberately use nuclear explosions to mitigate climate change. Aside from the obvious fact that there could hardly be a worse approach to climate change, it certainly won't help address the equally important ecological destruction that is a result of human overshoot – habitat destruction, ocean acidification, over-fishing, logging, pollution, etc. I thought Radio Ecoshock had higher standards. I thought I made it clear that using nukes is not an option I endorse. However, at first I thought Beckwith might have gone way too far. But looking into it, this idea of a nuclear cooling, whether unintentional through a regional war, or intentional, IS being discussed by some serious climate scientists. Few talk about it to the public, but scientists like Alan Robock published about this in Scientific American Magazine in 2010 – 6 years ago. If Scientific American can talk about it, I think Radio Ecoshock can acknowledge that elephant in the climate room too. The elephant in the room is geo-engineering and not the nuclear option for it. Paul Beckwith is an ardent geo-engineering guy, who like a politician who wants to raise taxes tells you that taxes must go 40%, but then only raises them 20% so that you feel grateful. This is the oldest trick in the book. James Hansen and 18 of his peers, must have made a mistake because Alex doesn't like what he hears, which is fine, but Hansen doesn't say nuclear is a solution to climate change, he believes it is something we have to use for planetary survival. Sure, there are a lot of climate scientists who want the funds to refute his assertions. I think Gail is wrong when she says the argument that western civilization is to blame for climate change is weak. It isn't it's actually quite the opposite. This mode of production is incredibly wasteful and damaging. And it's a product of Western capitalism. No societies before this produced so much and wasted so much. But having discovered this way of living is a disaster western civilization has mastered the art of confusion and misinformation in a way to completely scupper any action. Between the capitalist mode of production, waste and finally control of mass thinking by a small minority (think corporate media) you have a civilisation that in most probability will lead to demise of its species. Just as capitalism is no 'ordinary' civilisation the denial practiced by it isn't just ordinary human denial. Like everything in capitalism it's on steroids and then some. Maybe it's a human trait to deny, but the denial practiced by Western civilization is on a tragic scale and takes a significant role in exacerbating climate change. Alex, for me, is right.